with nine short videos that explain each of the steps. It’s no secret that the American political landscape has grown more divided in recent years. The conservative right has been fracturing since the emergence of the Tea Party. The liberal left hasn’t been as internally divided, but that’s changing now since the Democratic field has officially been narrowed to just two presidential candidates. As I write this article on Presidents Day in February, it’s impossible to escape the presidential primaries, since debates seem to be on TV every week and since they’re covered in the media daily. Misinformation is everywhere. It’s hard to know what to believe. This is where librarians come in. I realize that many of you happily avoid bringing politics into your work. After all, you’re supposed to be unbiased, right? And you can’t afford to alienate anyone. You probably have your hands full doing your regular duties of promoting good searching and wise information usage. You’re also tasked with doing outreach, increasing library awareness and use, and even “building community.” So why would you want to get involved in politics? Because those tasks can relate directly to elections. I see a huge place for librarians in the American political process. Think about it: You’re the people most qualified to fight misinformation and guide the electorate to vetted research sources. One way to reach out to people who don’t normally use libraries and to build awareness of why they still matter is to become the center for the most trustworthy data. And when trying to build community, you need a topic that affects and interests everyone, something to bring them together in discussion. In this especially contentious election year, U.S. voters desperately need to be able to separate fact from fiction in order to make well-informed choices in the primaries and in the November election. Why not prove your value by becoming the top place in your community for fact-finding and discourse? You can save people time by pointing them to good resources, by helping them understand differing viewpoints, and by offering an unbiased, safe place to learn. Here are 10 specific ways that you can do that, in any type of library, without taking sides. 1. Create a portal of voting information. You can find much of what you need by linking to local, state, and federal sites. Include information on voter registration (try www.usa.gov/register-to-vote): links that are specific to your state, application deadlines, locations and hours of polling places, etc. Be sure to offer info on absentee ballots, especially if you’re in a university library, where many young people may be living on campus, outside of their home voting districts. This is the least you can do to inform the electorate. 3. Research local issues and create a webpage of information from all sides. While the presidential election is the biggie this year, local elections deserve attention as well. And they’re much less likely to be covered by the fact-checking sites. Oftentimes, the loudest or most sensational voices are the only ones that the media covers, so it’s not easy for nonprofessional researchers to learn about opposing viewpoints. If there are any hot-button issues in your area, you could be doing everyone a favor by giving equal exposure to all sides. 4. Hold a voter registration drive. Work with local government or groups like the League of Women Voters to set up a table in your building where citizens can come in and register to vote. If your library runs English as a Second Languages classes or serves a large population of immigrants, you may be in a unique position to help people register to vote for the first time. Plan ahead so you can widely publicize the times when this service will be available (evenings and weekends may be especially helpful to working folks). Perhaps you’ll want to set up a library card sign-up table nearby to make sure that your library also benefits from performing this civic duty. 5. Point people to governmental websites. Many citizens don’t know that at Congress.gov (www.congress.gov), they can find information about any current senator or representative, including his or her bills and committee assignments. 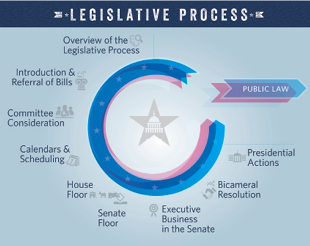 In addition to the individuals’ info, there are scads of data on Congress itself, including documents that explain the legislative process (in English and Spanish) and short videos on the legislative process (English only). Of course, there’s the massive White House site (www.whitehouse.gov), with its seemingly endless lists of subsections that tell you everything about everything, including people, issues, and how to get into a tour of the White House. (Never mind that though, there’s a virtual tour on the website.) There’s even a slideshow of the official Photo of the Day. 6. Host town hall meetings. If your library can organize an event, partner with local campaign workers to set it up. If you don’t want to get too involved, simply offer the library’s space as the meeting site. If you’re really afraid of trouble, make it a virtual town hall in which candidates address a few predetermined questions (without an audience), and record or livestream the event. No matter what type of meeting you have, enrich it with reading lists, links to useful websites, and instructions for accessing further information. Also, alert the media to get exposure for the library. 7. Help rival candidates come together. Wouldn’t it be fun to invite competing mayoral candidates to appear together on a READ poster, each touting his or her favorite book? Or you could invite each one to read a story to children and let the kids “vote” on their favorite reader. Create a photo op by issuing each candidate a giant cardboard library card. Ask each about his or her favorite newspaper or magazine. Position the library as a place where all sorts of people can work side by side. 8. Organize a “Human Library” event. A “Human Library” is a short-term program in which interesting or unusual people agree to be “human books” that attendees can “borrow” for 15 to 30 minutes in order to talk to and learn from them. This is a wonderful way for curious people to learn about others whose career choices, backgrounds, or ethnicities are different from their own. There’s a global organization that offers guidance for holding your own event. As its website (http://humanlibrary.org) explains, “The Human Library is designed to build a positive framework for conversations that can challenge stereotypes and prejudices through dialogue. The Human Library is a place where real people are on loan to readers. A place where difficult questions are expected, appreciated and answered.” Your human books don’t have to be candidates; they can simply be people whom others want to understand better: refugees, liberals/conservatives, activists for various causes, etc. 9. Use materials from ALA’s Libraries Transform campaign. ALA is running a nationwide campaign called Libraries Transform (www.ilovelibraries.org/librariestransform), which is “Designed to increase public awareness of the value, impact and services provided by libraries and library professionals” by “Showcasing the transformative nature of today’s libraries and elevating the critical role libraries play in the digital age.” It comes with a branded toolkit of messages and downloadables, along with strategies and tactics for employing them. ALA encourages all librarians to use the brand, hashtag (#librariestransform), real stories, postcards, web banners, etc., around their communities to spread the campaign’s main idea: “Libraries today are less about what they have for people and more about what they do for and with people.” There’s even a wonderful image about the presidential election. Let these tools inspire you and save you time. 10. Get info and images from the nonprofit political action committee EveryLibrary. The mission of EveryLibrary (www.everylibrary.org) is to help secure funding at the ballot box, so it works with individual libraries on their ballot issues. However, this organization has info that can make you feel more comfortable with politics. You can read stories about the libraries it has assisted. 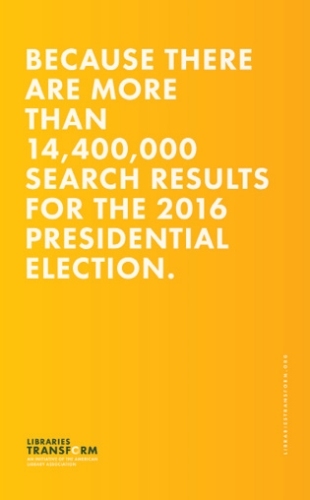 There’s a VoteLibraries 2016 marketing and awareness campaign running during the primary election season. There are downloadable images. Perhaps more importantly, EveryLibrary has started a new open access journal called The Political Librarian. You can download the first issue at http://everylibrary.org/wp-content/uploads/2015/09/Sept-2015-Issue-1.pdf. You may notice that I haven’t specifically recommended pointing to any news or media sites. This is not an accidental omission. I think most people already have their own favorite TV or radio stations, newspapers, magazines, websites, or personalities. Also, many citizens see “the media” as part of the problem. All of the sensationalism clouds the facts. So rather than listing media sites, share those that people are less likely to know about; ones they don’t already have preconceived notions about. Prove to the American electorate that librarians really do offer unbiased information beyond what they’ll find in a quick Google search. Use your mad research skills to dig deeper and to gather data that’s of great value. Then use your promotional skills to tell voters how these websites, portals, and events can benefit them. So c’mon, library folks. This is no time to be quiet or reserved. Public libraries, especially, have long been touted as defenders of democracy. Here’s the perfect chance to prove it’s still true. When everyone insists that their favorite sites are the correct and truthful ones, this is the perfect opportunity to use your good reputation as trustworthy sources of information. This is a chance for you to shine, to gain respect, and to attract new patrons. Get out there and make a difference! Kathy Dempsey is a marketing consultant at Libraries Are Essential (www.LibrariesAreEssential.com) and the author of The Accidental Library Marketer. She also organized and chaired the LMC Conference. Dempsey has been the editor of MLS for 21 years. Her email address is Kathy@LibrariesAreEssential.com.